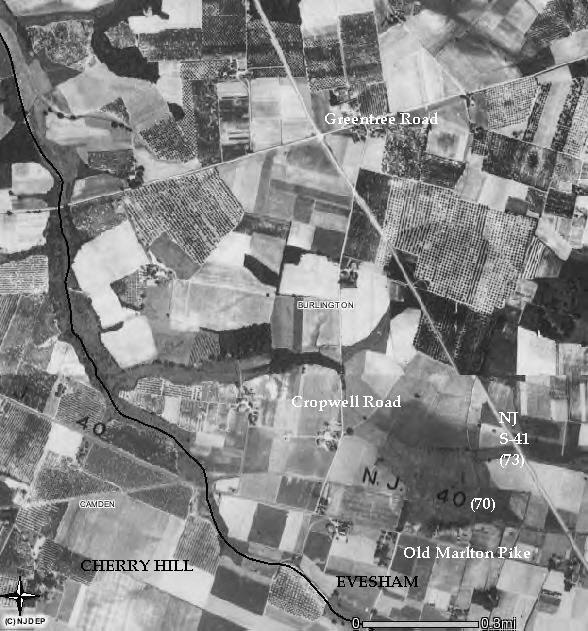 In this 1930's aerial photo, the Evesham portion of Rt. 40 (today Route 70) appears to still be rail road tracks-bearing to the South West near the Cherry Hill border, intersecting with Old Marlton Pike. Route S-41 (today Route 73) was newly constructed at this time. One can imagine how light the traffic was. The darker areas of the photo are wooded areas, rows of orchard trees are seen as black lines and the grey areas are cultivated fields. The black line running along the left side of the image is Pennsauken Creek.